Much more than a place to learn or perfect Spanish, Madrid is a modern political, cultural, and financial center. Madrilenos are justifiably proud. Much more than a place to learn or perfect Spanish, Madrid is a modern political, cultural, and financial center. Here, people have managed to preserve the old while embracing the new, keeping alive small-town traditions alongside cosmopolitan cultural events and a world-famous nightlife scene. The city is now enjoying its latest renaissance with numerous restored historic buildings and an abundance of well-maintained parks and public squares. 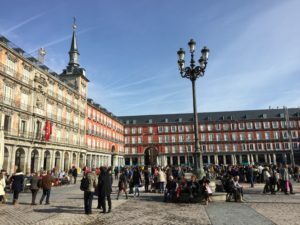 As a student in the Syracuse Madrid program, you will start your semester by embarking on one of several traveling academic experiences aimed at providing the best introduction to Spain and Europe. During that time, you will also meet fellow classmates and Syracuse Madrid staff and faculty. All of this will help you transition to life in your new city as you find your place in Madrid.